Saga, Volumes 1 & 2, by Brian K. Vaughn & Fiona Staples: Hot damn, how did I wait so long to pick these up? While I've never been a big reader of comics or graphic novels, the right combination of stunning art, interesting subjects and just enough WTF-ery is generally all it takes to pull me in. The last time that happened was with Bill Willingham's Fables series, which I devoured, but Saga tops the WTF-ery of Fables by a long shot. And then some. And that's a good thing. The story of two star-crossed lovers trying to raise a kid in a world and find peace--yes, entire world--at war might sound hokey, but when you consider that both are gunslinging, cursing motherfuckers, it becomes anything but hokey. I read the first two volumes back-to-back, and am eagerly awaiting my library's copy of the third volume. Fallen Beauty, by Erika Robuck: I've come to expect nothing short of fascinating historical fiction from Erika's work, and Fallen Beauty did not disappoint. A truly captivating story not just of Edna St. Vincent Millay, but of the time in which she lived. Read my full review of Fallen Beauty. A Few Seconds of Radiant Filmstrip, by Kevin Brockmeier: Ok, I'm cheating on this one, because it doesn't actually publish until April, but I had to include it here. I read (and adored) Brockmeier's The Illumination, and his memoir of the seventh grade was intriguing for a variety of reasons: it focuses on just one year of his life, it's told in the third person, it has elements of the fantastical. I had the chance to interview Brockmeier about the book and his experience writing it; stay tuned for my full review and interview in Shelf Awareness this month. Hotel on the Place Vendome, by Tilar Mazzeo: Mazzeo's history of the Hotel Ritz in Paris reads like an if-walls-could-talk memoir of a building, documenting the famous--and infamous--inhabitants of one of the world's most recognized hotels. From Coco Chanel to the Nazis and beyond, this proved one of the books I couldn't stop talking about, filling my friends' ears with, "Did you know...?" statements left and right. Read my full review of Hotel on the Place Vendome, and my blurb in Bloggers Recommend. The Heaven of Animals, by David James Poissant: I requested this on Netgalley on a whim, and could not be more thankful. Poissant's stories are absurd and heartbreaking, emotional, wonderful, hilarious, awful. I had to stop reading halfway through because I could not see the pages through my tears, and yet the stories never left me without hope. I didn't write a full review of this one because I wasn't quite sure how to put into words how much I loved it. Just read it, please? Read my blurb in Bloggers Recommend. Redeployment, by Phil Klay: I did manage to review this one... barely. Another collection of short stories, another for the "not quite sure how to find the words" pile (a rare thing for a book reviewer, one hopes). Klay's collection paints such a vivid, varied portrait of the life of a veteran that anyone who's anyone should take the time to read it in order to better understand our nation's military. Read my full review of Redeployment, and my blurb in Bloggers Recommend. I'm so excited for the third volume of Saga. I happen to know that my brother-in-law is getting it for his birthday, and I'm planning to borrow it as soon as possible. I have never heard of the Saga books, but now I want yo check then out immediately! I'm so excited to get to the third volume of Saga, too! And I can't wait to read Redeployment, too...I'm hoping my book club makes it one of our upcoming picks. Sounds like it was a good month for you! I'm reading this now and loving it! It's the type of book that basically reads itself. By that I mean that it's easy to read and intriguing, and the pages just keep turning. I read some of the Millay biography, Savage Beauty, in college, but apparently I didn't get very far because I don't remember all of the debauchery. I might just have to pick that one up again! You read so many great books in March. Way to go!! There's 4 on your list that i'd like to get my hands on. I read and enjoyed Fallen Beauty too but I passed on Redeployment - short stories just aren't my thing - although I did hear it was well done. I've only recently started to warm up to short stories, but I was glad I did so in time for Redeployment. It really is fabulous. Thanks! 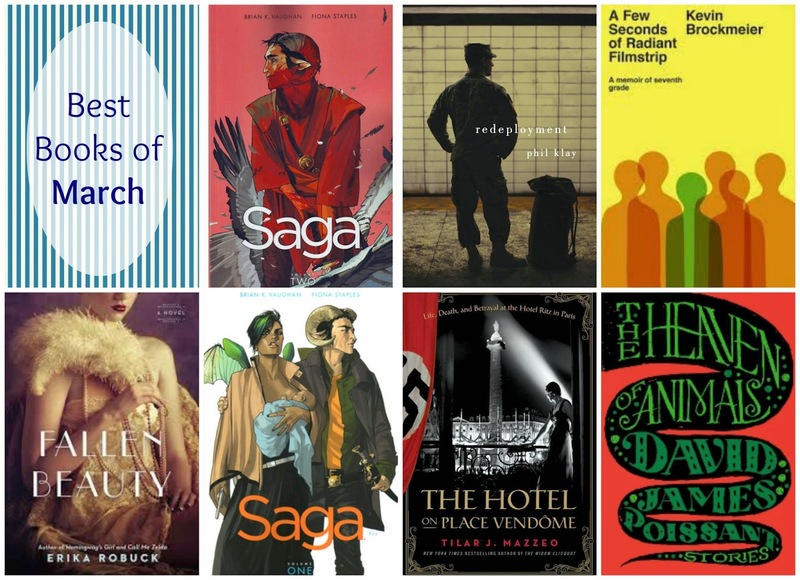 It didn't feel like a big reading month for me, but when I started collecting titles for this post, I realized it wasn't so bad. Which is mostly why I enjoy these wrap-up posts! I have it on hold from my library (I'm trying to slow my rate of book acquisitions, therefore not buying it), but I am SO impatient. Redeployment is fabulous--I hope your book club reads it! LOTS to talk about there, I think. They only just popped up on my radar, and I am totally hooked. I liked the writing enough to want to read more from Moore, but I just could not get into these stories. Maybe it was bad timing, or high expectations... not sure. Just not for me. Sounds like you had a pretty good March! Hope the weather turns nicer for you! My mom lives in Annapolis, and she is despairingly sick of snow!